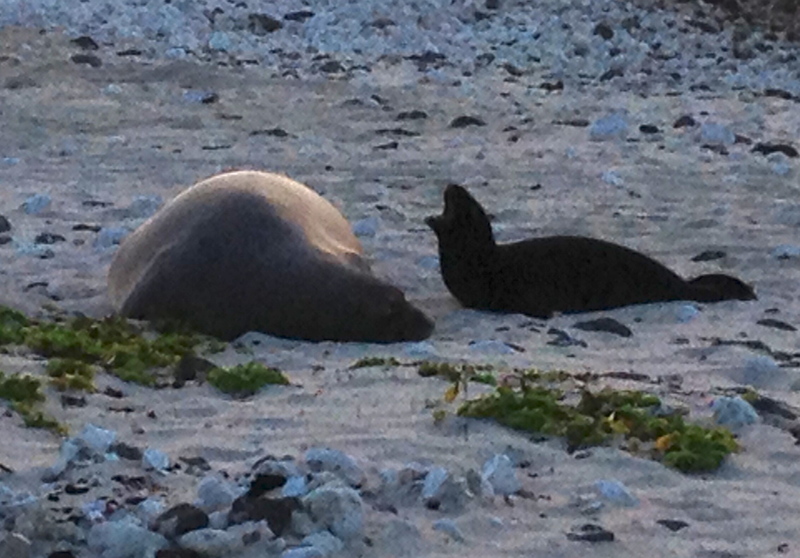 I identify with this Baby Monk Seal, God. She is crying for her mommy to wake up. The mother, Irma, will stay with her for six weeks . . . feeding her and teaching her to swim and fish. Then the mother will have to leave. She will not have eaten for six weeks. Leaving is part of Your Plan, God. Is there EVER a good time for a Mother to go? I think not, God. My mother is 98 1/2, in hospice care, and I am suffering. It’s true that I still have Mom for a brief time more, visiting when I can. Today she blew kisses at me as I left. That felt good. I don’t go to see her more than once or twice a day. Part of me was wishing that we had hospice at home so I could see her more often. But, a dear friend, who did that for her mother, said — Oh NO! — that I made the right decision! Actually, it was the only decision that looked doable. I have been taken by surprise at the grief flowing through me. It’s very primal, God. I guess grief always is. But because my husband Kit and I had been “assisting” mom daily the last few years, playing games and talking — part of me sees her as my baby. So it’s a sort of double whammy. The strength of these Grief Currents is amazing. Walking this path with my mom feels almost perilous — as if I too might be swept into the River Styx. This is absolutely beautiful, Mom. So touching…. Mom, I love you soooooo much!!!! I’m SO THANKFUL you are a mommy and KNOW how it all feels . . . although come to think of it . . .you know because you are a daughter. As I said, I get confused! AND I REALLY REALLY LOVE YOU TOO!!!!!!!! Never forget what a good daughter and mother you are. Thanks, Adri! I’m hoping I won’t focus too much on guilt . . . more just on grief. . . to process it by feeling it and sharing it . . . and releasing it.